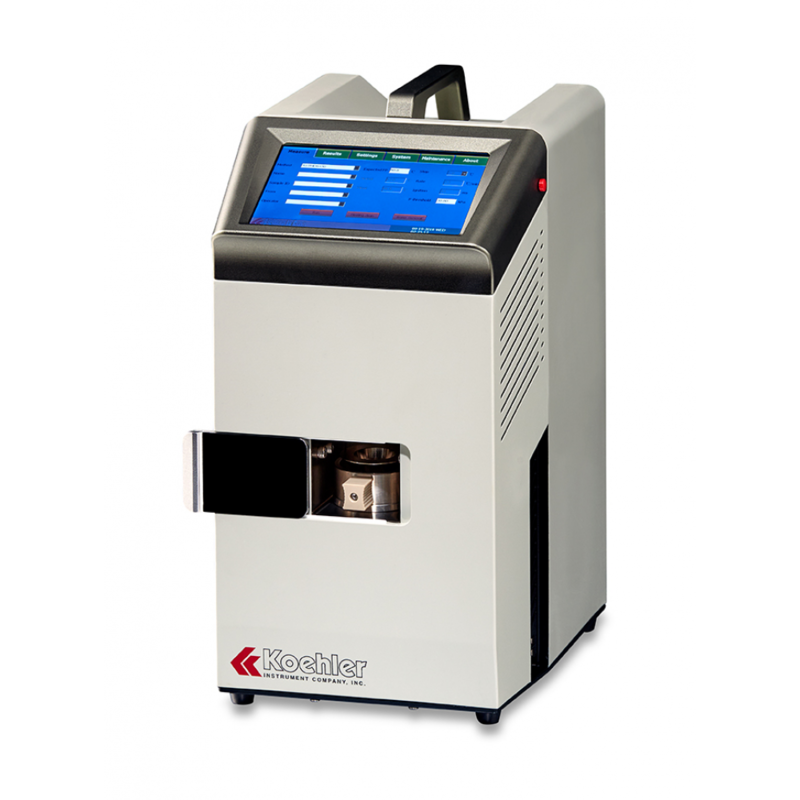 Automatic Microscale Continuously Closed Cup Flash Point Analyzer – Koehler Instrument Company, Inc.
ASTM D6450: For determination of flash point of fuel oils, lube oils, solvents and other liquids by continuously closed cup tester. The measurement is made on a test specimen of 1 mL and utilizes a closed but unsealed cup with air injected into the test chamber. This method is suitable for testing samples with a flash point from 10 °C to 250 °C. ASTM D7094: For determination of flash point of fuels including diesel/biodiesel blends, lube oils, solvents, and other liquids by a continuously closed cup tester utilizing a specimen size of 2 mL, cup size of 7 mL, with a heating rate of 2.5 °C per minute. This test method utilizes a closed but unsealed cup with air injected into the test chamber and is suitable for testing samples with a flash point from 35 °C to 225 °C. Under specified test conditions, when a sample is heated to the temperature called flash point, the sample vapor and air mixture are ignited instantly. Flash Point is one of the indicators for the evaluation of a materials' combustion tendency. If the flash point Is low, the combustion risk would be high. As for transport and safety regulation, flash point is used for the classification of "flammable liquids". Also, flash point is used for quality control index or determining the existence of highly volatile or flammable substances in relatively nonvolatile or nonflammable matter, e.g. lubricant mixed with a small amount of diesel or gasoline. 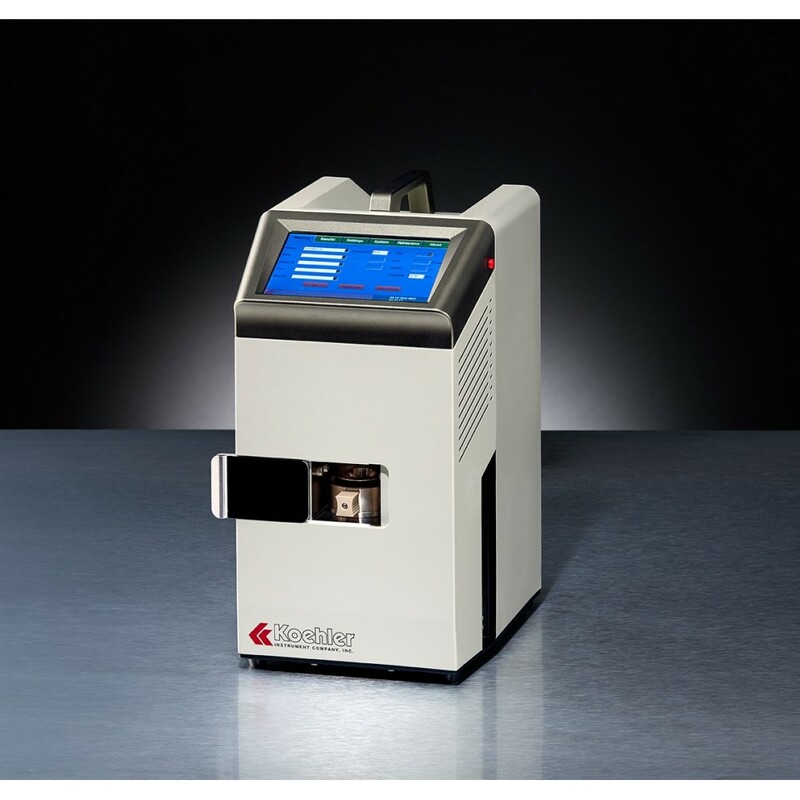 The Koehler K24880 Microscale Continuously Closed Cup Flash Point Tester works in the following manner. 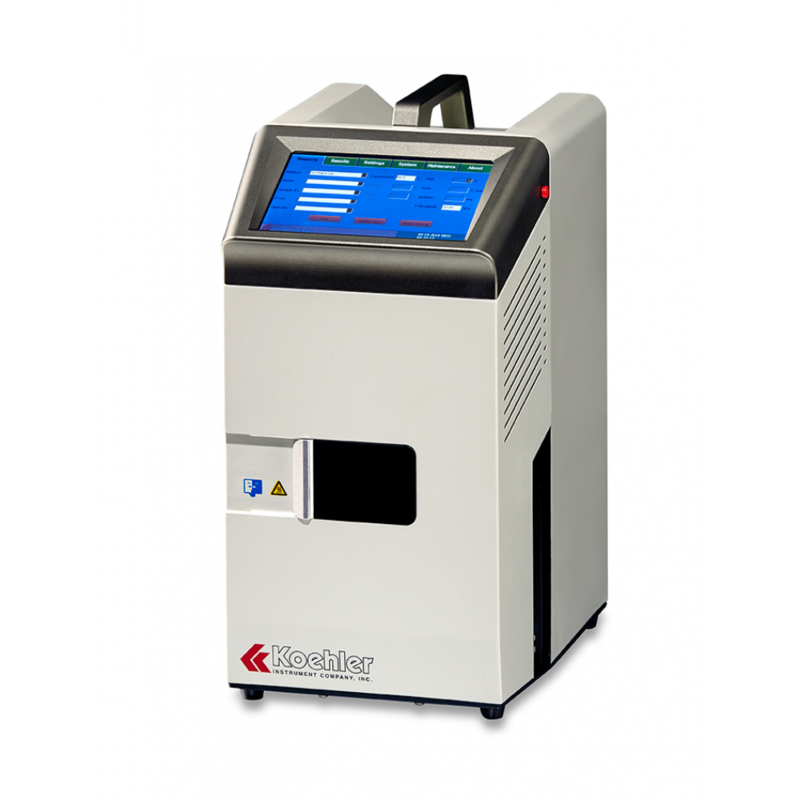 The temperature of the analyzer is adjusted to at least 18 °C below the expected flash point. The sample is injected into the sample cup. 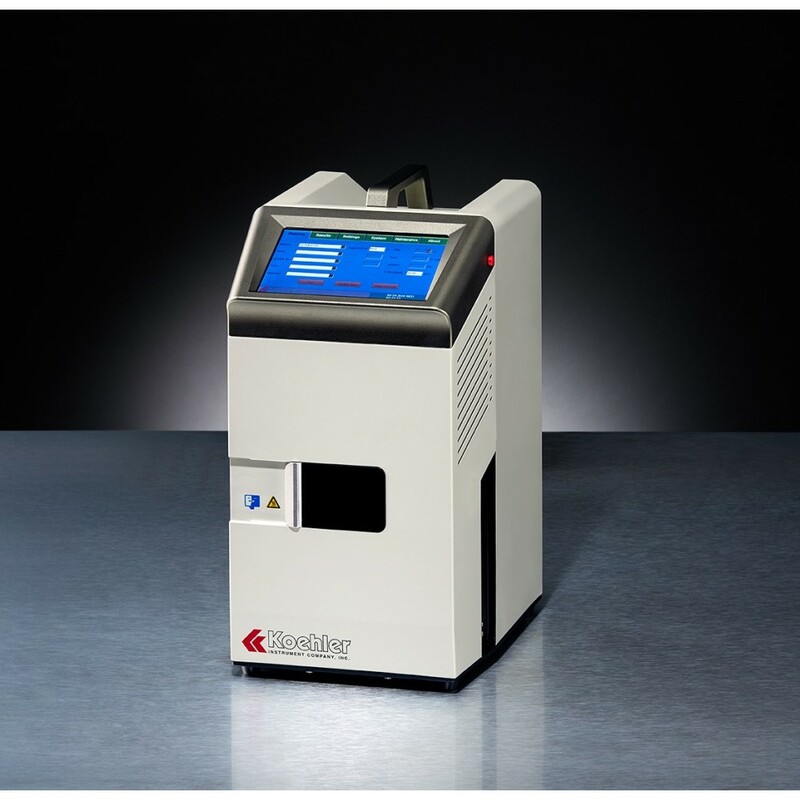 The operator must ensure that the sample and sample cup temperature are both at least 18 °C below the expected flash point (the sample and sample cup may be cooled if necessary). Then the sample cup is raised towards the oven forming a closed test chamber, which is not sealed. After every ignition, the proper volume of air goes into the test chamber to supply the next ignition with oxygen to burn. The pressure in the unsealed closed test chamber should be ambient atmospheric pressure, except during the short period of air introduction and the time when the flash point is achieved. The pressure increase comes after discharge of air, so each time after the air discharges, the chambers pressure is higher than ambient atmospheric pressure. When the pressure increase exceeds the specified limit, this is recorded as the flash point temperature (which has not been corrected).